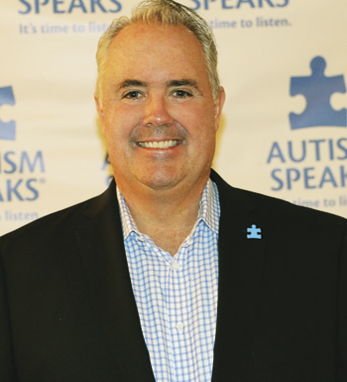 As the newly elected Chairman of Autism Speaks, Brian Kelly takes charge of the nation’s leading advocacy group for individuals on the autism spectrum and their families. Kelly’s oldest child, Patrick, has autism. “As a parent of a child on the spectrum, I joined Autism Speaks because I saw how underserved the autism community was . . . I am honored and humbled to have been elected Chairman of the Board as we embark on the next chapter of our mission.” Kelly, who in addition to Patrick has five other children, is co-founder of Eastern Real Estate LLC, a leading commercial real estate investment, development, and asset management firm. The same energy, creativity, and drive that built this successful firm have been channeled to improving the lives of people with autism and their families. In 2006, he led the development and property acquisition of the Melmark New England School in Andover, Massachusetts, a school that services individuals with autism and other disabilities. The following year, Kelly and his wife, Patricia, donated $2.4 million to fund the construction of the Koegel Autism Center at the University of California, Santa Barbara. Since then, the Koegel Autism Center has become world-renowned for its Pivotal Response Treatment, one of the few intervention methods for autism that is both comprehensive and empirically supported. He and Patricia have also established the Brian and Patricia Kelly Postsecondary Scholarship Fund to help promote additional opportunities for young adults to pursue postsecondary education and ultimately increase the number of enrolled students on the spectrum. “Brian Kelly has been a big voice at the Autism Speaks table and, as the new chairman, he is prepared to carry the torch forward on behalf of our families,” said Bob Wright, who founded Autism Speaks with his wife Suzanne in 2005. The Wrights are grandparents to a child with autism. Kelly’s maternal ancestors hail from Mayo, Kerry, and Limerick and settled in New York. His paternal ancestors emigrated from County Cork during the nineteenth century. His great-grandfather’s cousin was none other than Honest John Kelly, congressman and sheriff of New York County and national Democratic power broker, who most notably succeeded Boss Tweed as leader of Tammany Hall from 1872 to 1886. Both of his parents have acquired Irish citizenship and his father is currently writing a book about his ancestors’ 35-year career in public service. Kelly was raised in New York, but spent most of his adult life in Boston, where he met his wife Patricia. He and Patricia now live in Santa Barbara, California with their six children. For more information about Autism Spectrum Disorders, visit the Autism Speaks website at autismspeaks.org.